The first time I heard of Italian chef Massimo Bottura was in 2006, when he appeared in Heston Blumenthal's "In Search For Perfection" series. In that particular episode, Heston was on a mission to create the perfect Spag Bol. After some research in Bologna, Heston ended up at in the test kitchen of the then two-star restaurant Osteria Francescana in Modena, were Massimo Bottura then demonstrated his unconventional version of a Ragù Bolognese. Massimo Bottura (b. 1962) opened his first restaurant, a roadside trattoria named Campazzo, in 1986 in Modena, where he worked alongside Lidia Cristoni, a female chef whom Bottura refers to as "she was my second mother-mentor". Later on he worked in the kitchens of chef Georges Cogny at his Michelin starred restaurant Antica Osteria del Teatro in Piacenza. After spending some time in New York City in 1993, Bottura returned to Italy, where he ended up being invited by Alain Ducasse (after he had had a meal at Campazzo in Modena) to do a stage at Ducasse's Louis XV in Monaco. 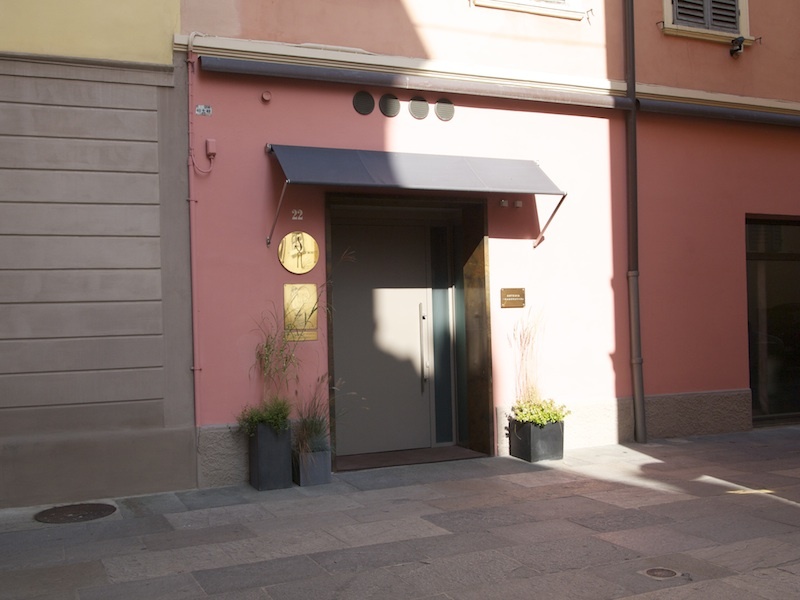 In 1995 Massimo Bottura opened Osteria Francescana. After a rocky start, the restaurant slowly began building a name for itself and a few years later Ferran Adrià dined at Osteria Francescana. The 1999 summer apprenticeship of Massimo Bottura at elBulli in Spain that followed from this visit, seems to have been a seminal period for Bottura. 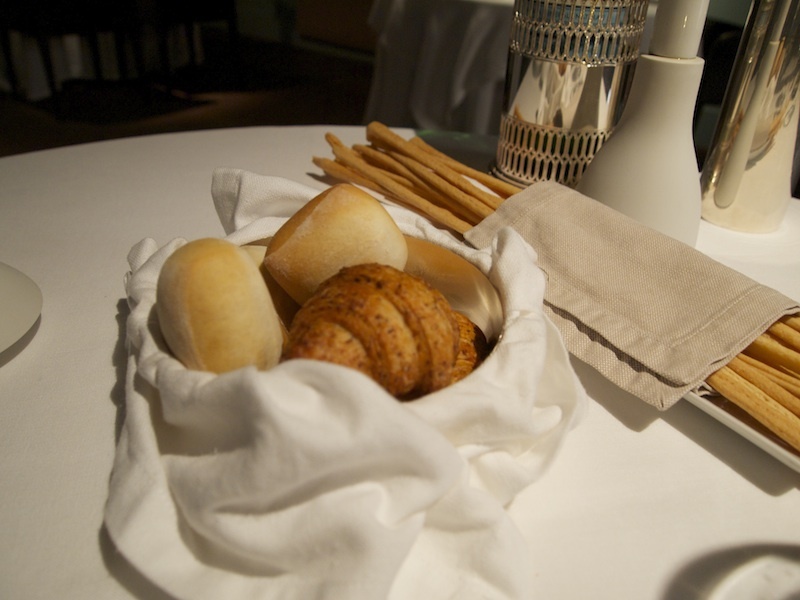 In 2002, Osteria Francescana was awarded its first Michelin star, a second star followed in 2006 and in 2012 the restaurant received its third star. 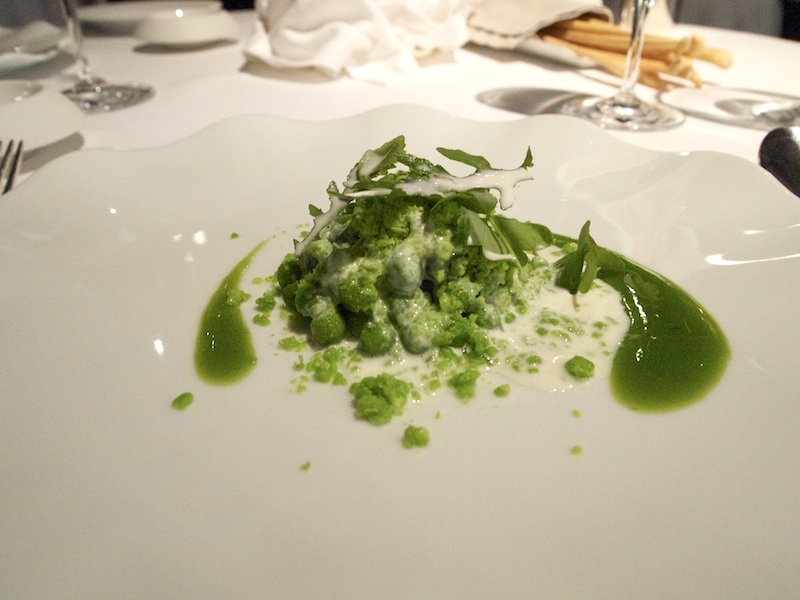 Osteria Francescana has also taken the World's 50 Best Restaurants list by storm. After becoming the highest new entry in 2009 at number 13 in the list, the restaurant now holds the number 3 spot. Osteria Francescana is open for lunch and dinner Monday till Saturday (no lunch on Saturday) and the restaurant offers an a la carte menu, a 7-course 'Traditions' menu for €130 and a 9-course 'Classics' menu for €165. Finally, there is a 12-course 'Sensations' menu, with dishes from the experimental kitchen, for €190. I had lunch at Osteria Francescana with my husband on Friday 1 November 2013 and we both ordered the Classics menu, plus one extra course to share, Tagliatelle with Bolognese ragù. 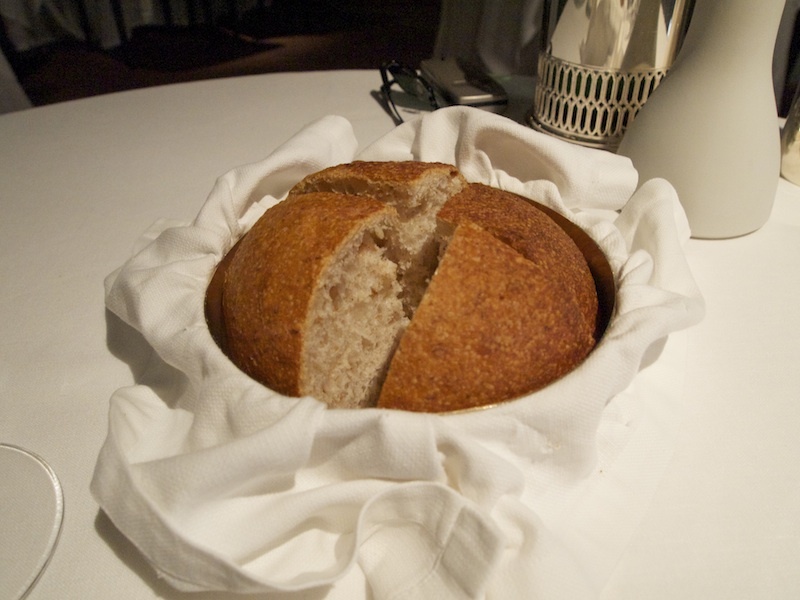 To start there was some home-baked sourdough bread served with Tuscan olive oil. The menu started with a crisp, deep-fried sandwich with an Aula fish filling. Aula is a freshwater fish, related to carp. On top of the sandwich was a quenelle of Carpione ice cream, a savoury ice cream with mixed fresh herbs, a nice hint of vinegar and a lovely touch of creaminess. The double-entendre here is that Carpione refers to both "carp" and "soused" (marinated or pickled in vinegar or white wine). The sandwich was wonderfully crisp and oily (not greasy). A lovely start to this meal, with nice flavour contrasts. 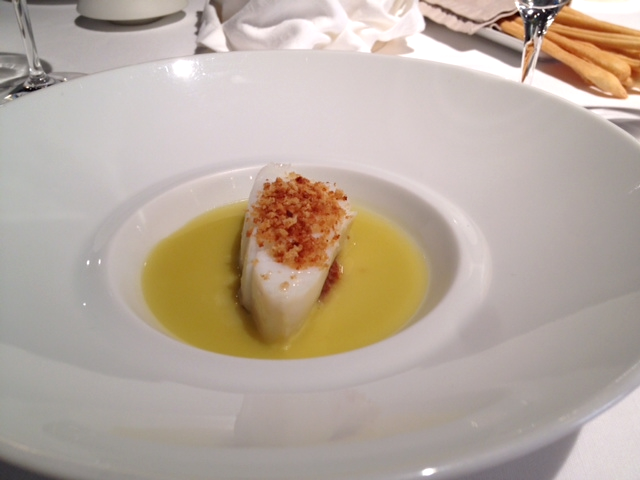 Second course was 'Baccalà Mare Nostrum'. Firm and moist salted cod (cooked sous-vide), covered with some buttery breadcrumbs, placed on top of a tomato, caper and anchovy pesto and served in a green olive and tomato broth. A happy marriage of power and finesse and a perfect balance of sweet, sour, salty and fruity, bitter flavours. The broth, which was beautifully seasoned with lemon, added a lovely freshness, that complement the rich and salty cod, and the pesto delivered a nice, warm finish. Next up wash a dish called 'Eel swimming up the Po River'. In part it tells the story of an eel swimming up the Po river and in part it tells the story of the journey of the Este family (also known as Estense) from Ferrara to Modena. The laste duke of Ferrara, Alfonso II, had failed to produce a legitimate heir and after his death in 1598, pope Clement VIII seized the opportunity to annex Ferrara and so the Este family was forced to relocate their 'headquarters' from Ferrara to Modena. 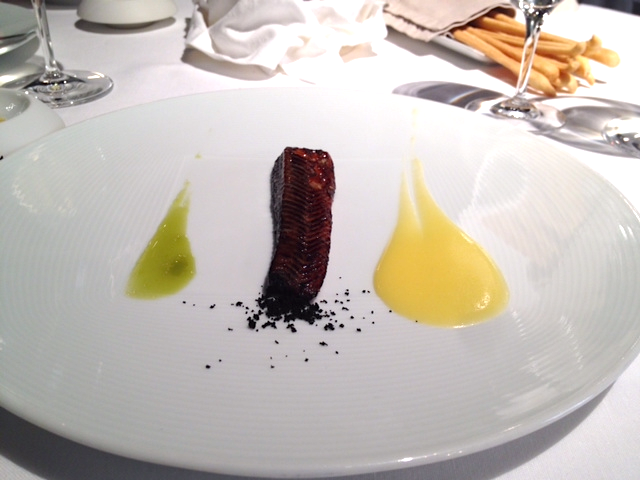 Anyway, eel cooked sous-vide that is then finished in the oven, and finally lacquered with saba (mother of Balsamic vinegar), served with polenta, a green apple sauce and some burnt onion powder. Meltingly soft and rich eel, the saba adding an elegant sticky sweetness. Japanese eel done the Italian way. Lovely clean-tasting polenta and the apple sauce was nice and sharp. A delightful dish with a beautiful balance between richness and freshness and the burnt onion added great length. Think Green was the name of the fourth course. A selection of vegetables and leaves, such as fresh peas, finely diced courgette and a bright green herb chlorophyll, with some milk curd spooned over. An original and creative dish that focuses on the natural sweetness of the vegetables. The flavours were delicate and pure and the milk curd delivered a lovely touch of creaminess. 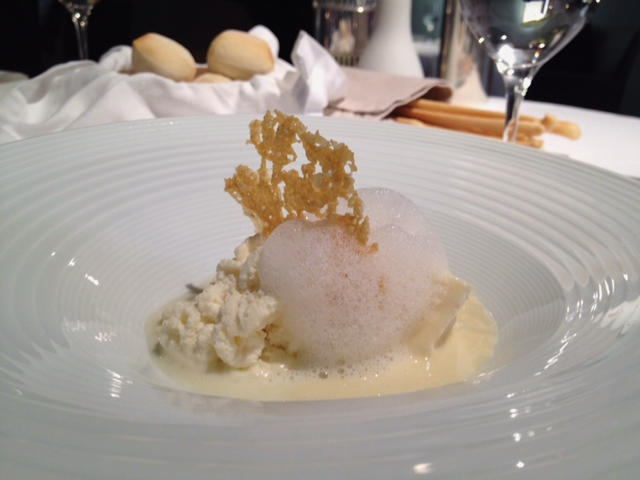 Fifth course: Five ages of Parmigiano Reggiano in five different textures and temperatures. There was a 24-month warm sauce, a cold 36-month mousse that had a curd-like texture, a warm 30-month demi-soufflé, a 40-month wafer and a 50-month foam. A sublime dish with a fantastic long finish a wonderful rotation of intense, creamy, salty, milky and nutty, Parmesan flavours. Each texture captured the characteristic and complex flavours of the Parmesan cheese of the age used for that particular preparation. 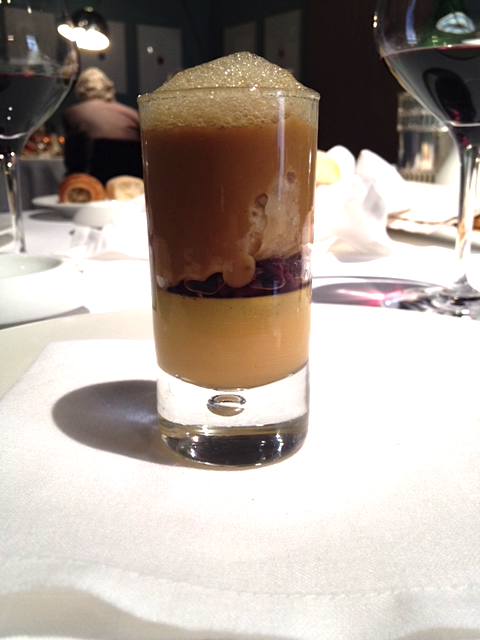 This was followed by a 'compression of pasta and beans', a dish, served in a shot glass, that pays tribute to Bottura's main culinary influences, Joël Robuchon/Alain Ducasse, Ferran Adrià and his (grand)mother. To start there's a layer of foie gras crème 'royale', followed by a layer of braised pork and fava bean cream mixed with small pieces of cooked Parmesan cheese rind and finally a spoonful of rosemary foam. 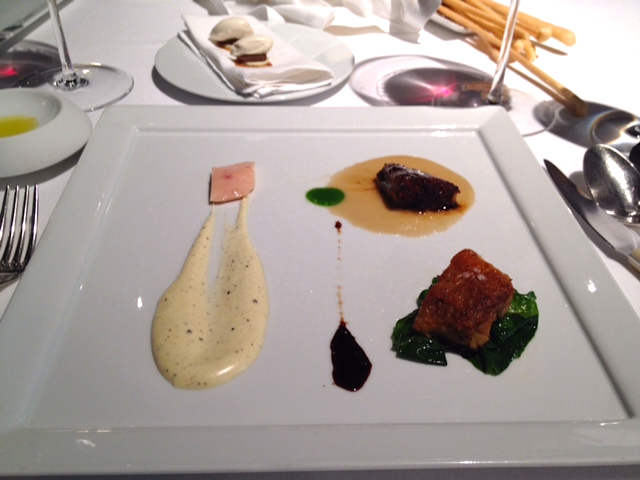 Spectacular flavours that had a wonderful, elegant richness and unctuousness to the them. Such refinement in what is almost a miniature dish. 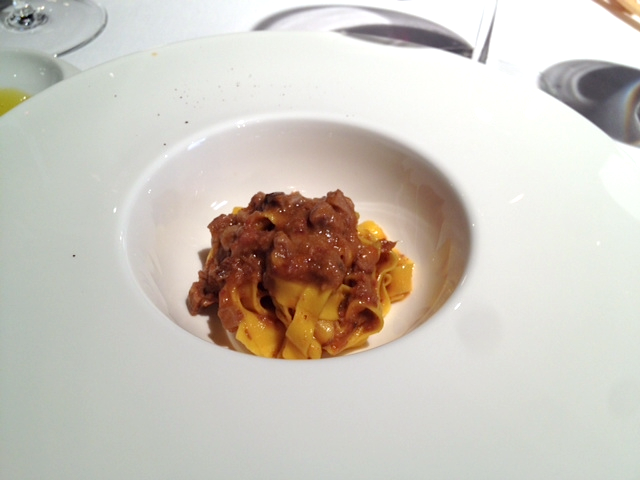 Next to arrive was the extra course: Delicious, flavoursome tagliatelle, served with a rich and creamy Bolognese ragù. Seventh course of the menu: 'Guinea fowl not roasted'. Beautifully cooked (sous-vide) succulent breast of guinea fowl, 'roasted' leg with a crisp skin and leg lacquered with reduced cooking juices, served with a spray of 'guinea fowl bones distillate'. The flavour and intensity of the reduced cooking juices was extraordinary and the crisp skin delivered a nice subtle crunch. Also on the plate was an incredibly buttery potato and black truffle puree and a syrupy bay leaf and balsamic sauce, as we were told, or maybe it was just an aged balsamic vinegar. Toast made from crispy guinea fowl skin, garlic and white and dark chocolate, topped with toasted bread ice cream was served on the side. All the individual elements in this dish were perfectly cooked, but for me the dish was lacking something that brought it all together. Having said that, the quality of the guinea fowl was sensational. 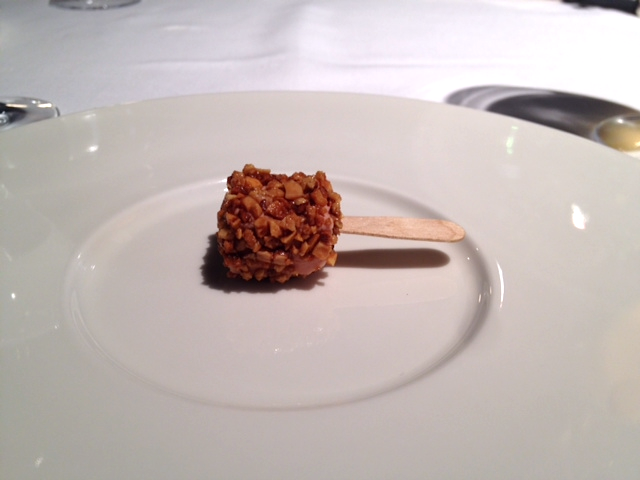 Before dessert we were served a creamy foie gras lollipop, dipped in chopped hazelnuts and almonds, with an aged balsamic centre. A wonderful flavour combination with great textures. The balsamic vinegar added depth and balanced the richness of the foie gras nicely. 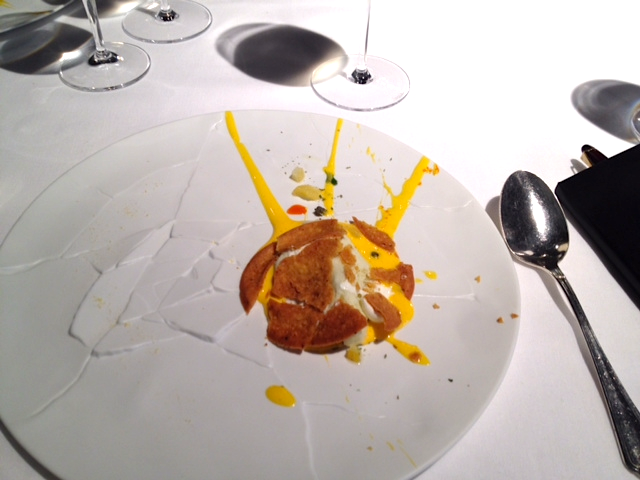 The final course was Osteria Francescana's world-famous dessert called 'Oops! A broken lemon tart'. 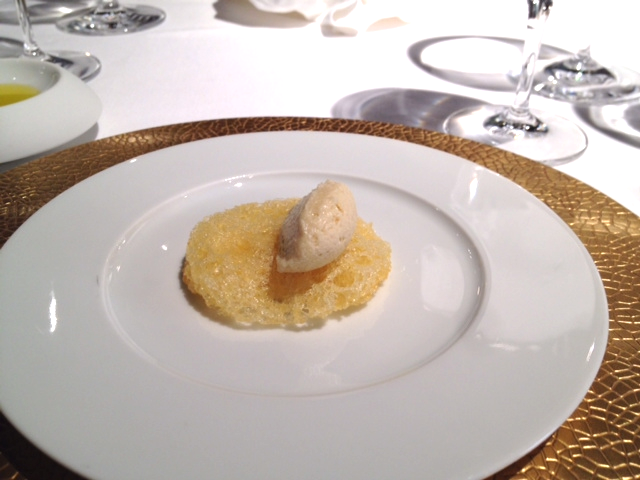 A carefully constructed dish, made to look like someone dropped the lemon tart, served on a specially designed plate. On the plate are small cubes of lemon, bergamot jelly, spiced apple, a few drops of chilli and lemon oil and salted and honeyed capers. Then a light and foamy, lemon and limoncello zabaglione is splashed over these ingredients, onto which a lemongrass sorbet and a broken biscuit is placed. A fabulous dish with a strong sense of theatre, but also a surprising, fastidious attention to detail. Beautiful balanced sweet and tart citrus flavours and the zabaglione gave the dish a lovely, silky and round finish. Italy is a deeply conservative country when it comes to food. Being an iconoclast in such an environment is not an easy job and Massimo Bottura’s road to fame has been long and winding. He himself has said that he wanted to vigorously shake up Italian cuisine, drop it on the floor and bring all the pieces back, rebuilt in a new way and project these flavours into the future. Some task to set oneself and one that requires the energetic, rebellious and curious personality of someone like Bottura. In many ways, his food reminds me of Pop art, in that it challenges the traditions of cuisine, uses irony and parody as powerful tools of expression and does not want to take itself too seriously. The work of Roy Lichtenstein in particular comes to mind (with “Oops, a broken lemon tart” as Bottura’s equivalent of “Whaam”, perhaps). In the presentation there is the occasional touch of abstract expressionism too (think Jackson Pollock). He is looking for freedom from the rules of international cuisine and wants to leave some space for the unexpected. His dishes tell stories and express emotions, they are witty, playful and very attractive to eat. His clever and creative, user-friendly cuisine is evocative – provocative even for those with a more conservative mindset. And yet there is something very elusive and enigmatic about this chef too, something very paradoxical about this restaurant. It starts with the name, which suggests a very simple, even austere establishment. Yet when you go in, what you enter is very much a modern three Michelin star setting. In the kitchen, a lot of what they do is very much about modern three-star cuisine, with plates specially designed for an individual dish, water baths and molecular techniques, and with pincers for plating-up; and then they throw the Zabaglione on the plate – quite literally. There seems to be a fundamental tension here, an internal conflict between the chef and the revolutionary. I would not go so far as to say that there is a Dr. Massimo and a Mr. Bottura, but in a way, this is a restaurant in wild revolt against itself. Osteria Francescana, with its multiple personalities (you can eat tagliatelle with Bolognese ragú here as well as some of the most experimental food in Italy), is a bit of a conundrum, a mystery that I have not been able to unravel completely. It is easy to see why Bottura’s approach of ‘let’s have fun, let’s break the rules’ would be attractive and inspirational to young chefs. For diners, this charming oxymoron in Modena will certainly make three-star food less daunting than it can be at more traditional places. This Osteria certainly stands for a unique experience but to my mind, at the end of the day its unconventional food is sometimes more thought-provoking than it is profound.